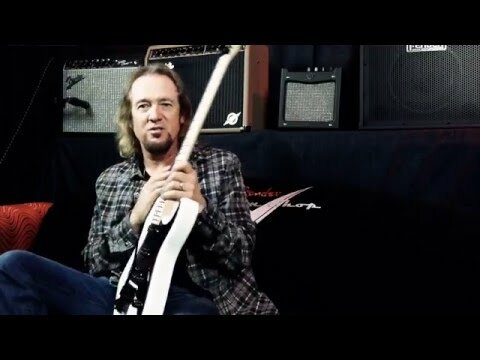 As a member of the legendary Iron Maiden, Adrian Smith has pretty much done and seen it all. Having toured the world extensively, a common sight on stage alongside Smith is his Jackson Signature model. The Jackson X Series Adrian Smith SDX Signature Guitar in Snow White offers the same sophisticated design at a more affordable price. The body is designed using basswood, a tonally balanced tonewood that is delightfully light in weight. The San Dimas body shape is ergonomically designed with comfort at the fore, featuring gently bevelled edges, and sleek contours that give establish a sumptuous playing feel. Finished in snow white and complemented by a black pickguard, the body is as visually striking as it is a pleasure to perform with. Connected to the body is a shredder's dream - a neck that allows you to play with unimpeded ferocity. Crafted using maple and shaped to Jackson's speed neck profile, your fretting hand is given the freedom to sail through licks and riffs with ease. Married to the neck is a rosewood fingerboard, which is home to 22 jumbo frets that are adorned with dot position inlays to guide your way. The 12- to 16-inch fingerboard radius makes it a breeze to throw in cheeky string bends, whilst the satin finish ensures that tackiness or stickiness are prevented from slowing you down. The body is home to the Floyd Rose special double locking 2-point tremolo bridge, which creates a seamless connection between the strings and body to optimise intonation and sustain. At the top of the neck is the Floyd Rose locking nut, which works dutifully alongside the Jackson branded tuning machines to ensure that string tension and tuning remains steadfast once locked in. No matter how much you dive and bend the bridge, your strings will return to position efficiently, and ready for more. The Adrian Smith SDX is fitted with a trio of Jackson pickups, with a humbucker in the bridge position that teams up with a pair of single-coils in the middle and neck positions. Control over the pickups comes in the form of master volume, and master tone pots with dome style control knobs. A five-way pickup selector switch allows you to select any pickup individually, or pairings of the bridge/middle or middle/neck. The range of tones available reflects the wide dynamic range and playing style of Smith, giving you the ability to pull everything from sparkling highs thumping lower frequencies, all with bite and clarity throughout. If you're looking to follow in the footsteps of your hero, then the Jackson X Series Adrian Smith SDX Signature Guitar in Snow White allows you to do it without breaking the bank. Grab yours today, and get playing!